Last Monday (June 25) four of us (Robyn, Jan, Sophia and I) left base camp at 5 am to do what we thought would be a standard nest check. 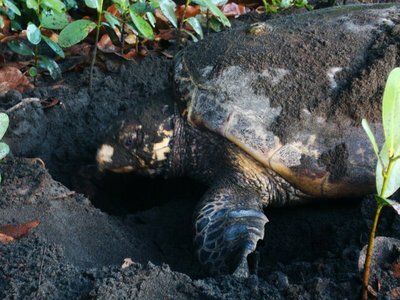 Little did we know that we were in for a surprise visit…… About a quarter mile into our walk, we encountered the first turtle track on the beach and as we approached closer to get a better look, I noticed something moving up near the vegetation. At first I thought maybe it was just a bird or something, but when I looked more carefully at where the movement is coming from, I saw a turtle!!!!!!! What is a turtle doing on the beach at this hour??!! 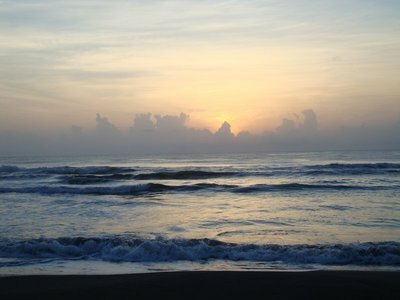 (Sea turtles come up on the beach to nest mostly only during the night.) This is not the first (live) turtle encounter we had during day time. Just a couple of weeks ago, the morning nest check team came upon a green turtle as well. We approached the turtle slowly so that we don’t startle her. Her carapace was covered with sand. Clearly she had already laid her eggs and was now disguising her nest. 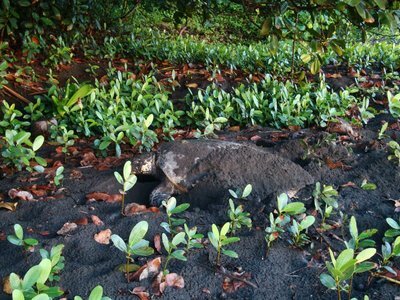 We have all seen a turtle nesting at night during one of our night patrols on the beach, but to see it during day light, it was quite a different experience. Wow! How lucky were we to have this encounter. Sea turtles are remarkable creatures that spend its whole life out in the sea except when it is time to nest. 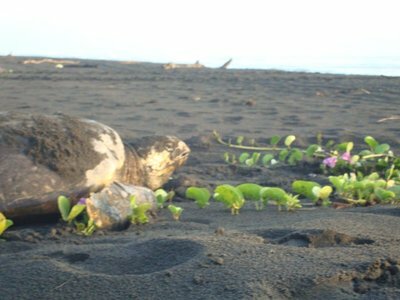 What I found so intriguing is that research has shown that some turtles come back to nest on the same beach where they were born. That’s after travelling for thousands of kilometers over the years it takes to reach maturity and yet it can still find that same beach. How amazing is that!!! Robyn checked to see if the turtle is tagged and it was. We recorded the number so we could monitor its nesting activities. We watched her for about 15 minutes before she turned and headed straight down the beach, back out to sea. While we all thought we had just witnessed a green turtle nesting, Robyn’s knowledge of the sea turtles confirmed that it was in fact a hawksbill! A hawksbill!!! We have only seen one hawksbill so far this season. What a great start to the morning for all of us. The more surprising news though came later that day when Robyn told me that when she checked the tagging number of that turtle on our database, it was tagged 16 days ago on June 9 by Kim. I was there on night walk with her that evening! Up to this point, we had no idea that we had seen a hawksbill. Nevertheless it was still a very memorable night not only because it was the first turtle seen and tagged by Kim but it was also when I counted eggs from a nesting turtle for the very first time (an unforgettable experience). I was so surprise when I realized that it was my second encounter with this turtle, I even got a bit emotional, few tears swelled up in the back of my eyes. This was one reunion I will certainly never forget…..
Hola! 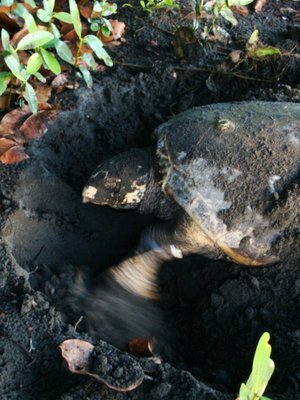 I’m back in the city of San Jose in Costa Rica after two months living in the jungle in Tortuguero National Park. The beach looking out to the Carribean sea was only a few steps away from our base camp and the forest was at our doorstep. There were no cars, everywhere we went was by boat. It was great! 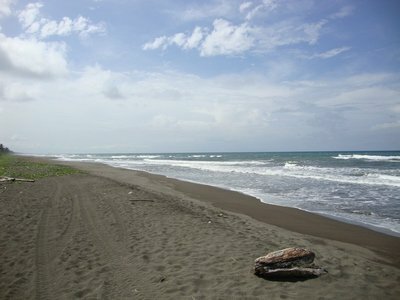 I was there on a volunteer project with GVI (http://www.gvi.co.uk/programs/wildlife-expedition-costa-rica). We live in Jalova, which is on the southern edge of the national park. The location was fantastic. Lying in bed at night, I could hear the sound of the waves from the sea and the different noises from the forests (including various birds and howler monkeys)---very cool indeed. I never thought I would ever spend two months living right by a beach! And it wasn’t just any beach, it was a beach where sea turtles have been using as their nesting ground. We have seen leatherbacks, greens, hawksbills and loggerheads (although the last two species are quite rare on this beach). 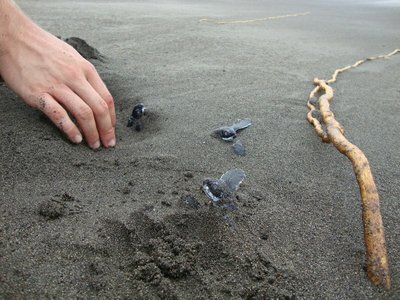 So one part of the work we did was monitoring these nests working alongside with the Sea Turtle Conservancy (http://www.conserveturtles.org/). These turtles are unfortunately classified as either critically endangered or endangered by the IUCN. We did both evening night patrols and morning check on the nests. This was by far the favorite part of the project for me (the canal bird survey is a close second). 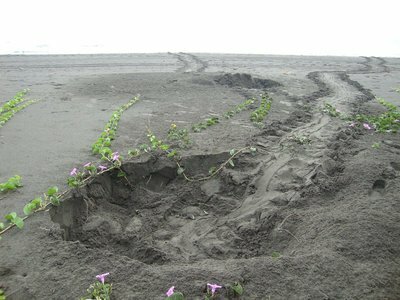 The night patrols involved walking up and down a 2.5 mile stretch of the beach monitoring any nesting turtle activities. 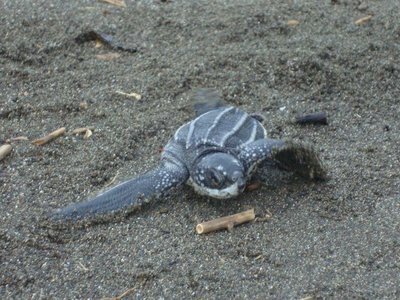 The first sea turtle I’ve ever encountered was a leatherback. They are the biggest of all sea turtle species and they are remarkable. I was so enthralled watching it disguise its nest using those unusually long front flippers, the same flippers they use to help propel its heavy body up and down the beach. Those flippers can spray the sand far! In several occasions, I have gotten sand all over me including in my ears, eyes and mouth. I didn’t mind it at all though, this experience was so worthwhile. One of the most memorable and intimate moments of my life was lying on the beach directly behind a turtle while she is laying her eggs. My left hand was stretched out under her cloaca inside the egg chamber while my right hand was stretched upwards trying to hold on tight to the measuring tape that other volunteers were using to mark her nests. It was like I was in the ‘superman’ position, slightly uncomfortable (and not to mention sandflies were biting my ankles!) but what I remembered thinking was: wow, how amazing it is that I get to be so close to a sea turtle while she is nesting. It was beautiful. The slimy eggs came out mostly two at a time and they were about the size of ping pong or golf balls. While this was happening, there was actually another green turtle several meters away from me disguising her nests. Once in a while, I could hear sand sprayed against the vegetation. After about 15-20 minutes, she was done and I had counted 106 eggs. She then carefully used her back flippers to cover up the egg chamber. 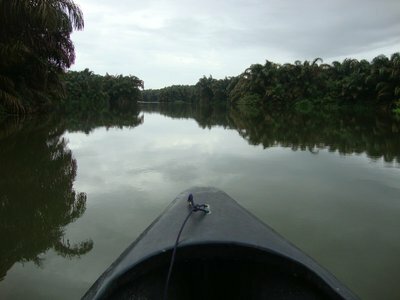 I also took part in many surveys in the forests and in the canals. I quite enjoyed ID’ing birds and other wildlife that I have not seen before. On these survey mornings, I am usually up by 4:30am and leave base camp by 5:30am (the earliest I have set my alarm clock was for 3:30am!!) I enjoyed the bird canal surveys a lot because we get to go in a canoe and paddle through the calm, quiet canals while spotting some interesting birds. This in some small ways reminded me of all those canoe trips I’ve done back home in northern Ontario. 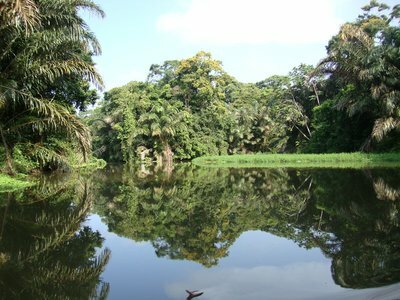 There have been so many memorable moments in Jalova and Tortuguero. Despite being there for two months, I was still encountering new experiences and wildlife that I have not seen before almost every day. I definitely picked the right project and the right time of year to be there (the leatherback nesting season is about to finish and the green nesting season started few weeks ago). I do however miss the cooler temperature (hot and humid climate is not for me…..and too many insect bites….ouch!) 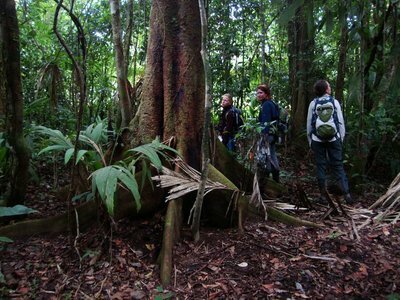 I very much look forward to spending the next two weeks higher up in the cooler mountain and up in the cloudforest in Monteverde. 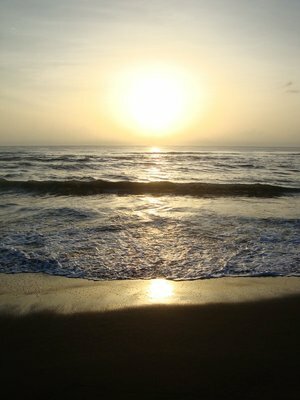 Thank you for the great memories and I hope to return to Tortuguero one day! Machete, corn, and Inca ruins!